(1)	It is the JSR Group's goal to make steady progress in realizing its corporate mission (Materials Innovation: We create value through materials to enrich society, people and the environment). This shall be done through efficient and transparent business management, by sustaining sound and healthy business practices. The Group will also continuously strive to create new corporate values with the hope of becoming an attractive corporation that can earn the trust of and satisfy the interests of all our stakeholders. (2)	The Company therefore has been and will continue focusing on the enhancement of corporate governance as an important management challenge. (1)	As a company with audit & supervisory board members, JSR principally monitors and oversees the execution of duties by directors and the management through its Board of Directors and audit & supervisory board members. (2)	JSR has continuously strengthened the function of management supervision, improved efficiency in decision making and execution of business duties, and enhanced the transparency and soundness of business management through the introduction of an officer system and the appointment of outside directors and audit & supervisory board members, who are independent from the Company and have extensive business experience and a high level of expertise. (3)	The Board of Directors established JSR’s corporate mission and makes important decisions including those of the Company’s business strategies. (4)	The Board of Directors developed an environment where management can take appropriate risks and demonstrate entrepreneurship through the introduction of a performance-based director remuneration scheme. (5)	The Board of Directors supervises directors and management through the assessment of business performance and appointment of directors. (6)	The current Board of Directors consists of seven (7) directors, three (3) of whom are independent outside directors with vast experience and extensive expertise in management of corporations and businesses. In the future, the Company will elect 1/3 (one third) or more independent outside directors with similar expertise in order to increase corporate value and oversee business management. (7)	The current Audit & Supervisory Board consists of three (3) audit & supervisory board members, two (2) of whom are independent outside audit & supervisory board members with extensive and sophisticated expertise (one is a lawyer and the other is a certified public accountant qualified as a certified public tax accountant as well). In the future, the Company will elect two independent outside audit & supervisory board members with vast experience and extensive and sophisticated expertise in such fields as law, accounting, and etc., to effectively audit the execution of duties by directors and the management. (8)	JSR established the Remuneration Advisory Committee of which majority members are independent outside directors and the chair of which is an independent outside director in order to ensure the objectivity and transparency of its directors’ remuneration scheme. The committee deliberates the basic policy of remuneration, the remuneration structure, the mechanism of a performance-based remuneration, the setting of targets, and assessment of performance, and submits its findings to the Board of Directors. (9)	JSR set basic policies on remuneration of directors as follows: the remuneration scheme should increase corporate value over the medium and long-term, attract diverse and superior personnel, be linked to short-term, medium-term and long-term business performance, have management and shareholders share profits, and ensure high transparency. Remuneration for directors consists of a fixed basic remuneration, an annual bonus linked to the attainment level of business performance in each fiscal year, a medium-term business performance-based bonus linked to the attainment level of the medium and long-term business performance, and restricted stock shares as remuneration designed to facilitate earlier sharing of corporate values between directors and the shareholders of the Company. In light of their roles, remuneration for outside directors and audit and supervisory board members consists of basic remuneration only. (10)	JSR established the Nomination Advisory Committee of which majority members are independent outside directors and the chair of which is an independent outside director to ensure the transparency of the policy and procedures of nominating candidates for directors. The committee deliberates criteria for the size, diversity in breadth of knowledge, experience, and capability necessary for the Board of Directors as well as criteria and procedures for nominating and/or identifying candidates for future appointment as CEO, directors, officers with directorship status (including senior officers), and audit & supervisory board members, and submits its findings to the Board of Directors. In order to ensure transparency of the deliberation, the committee takes such necessary measures as discussion solely among outside independent directors for the agenda relating to appointment/reappointment or dismissal of CEO. The committee, through its active involvement in the selection process, systematically develops and selects candidates for the successor to CEO in an objective and transparent manner by providing the pool of candidates with necessary training and coaching. (1)	JSR established “Responsibility to Our Stakeholders” (responsibility to customers, business partners, employees, society, and shareholders) as one of the important pillars of its management policies in order to express its commitment to its stakeholders. (3)	To fulfill its commitment to its stakeholders as stated in its“Responsibility to Our Stakeholders”, the JSR Group established “the JSR Group Principles of Corporate Ethics” as a code of conduct for its directors and employees and endeavored to ensure the code is thoroughly communicated to, and understood and observed by all directors and employees. (1)	JSR has continued to develop an environment where shareholders can appropriately exercise their voting rights at the ordinary general meeting of shareholders. (2)	JSR will continue to implement the following measures: holding an ordinary general meeting of shareholders earlier than other companies (in the middle of June each year); dispatching the notice of convocation of an ordinary general meeting of shareholders three (3) weeks prior to the date of the meeting; introducing an electronic voting platform via the Internet, etc. ; participating in the electronic voting platform for institutional investors; enhancing contents of the convocation notice; and translating the convocation notice into English, etc. (3)	JSR will explain its basic idea on its capital policies to shareholders. Especially in the case of those policies that may undermine the interests of existing shareholders, such as introducing takeover defense measures, MBO, and increase in capital stock, etc., the Company is determined to sufficiently examine their necessity and rationality and to take appropriate procedures to ensure sufficient explanation to shareholders. (4)	JSR holds listed shares as cross-shareholdings only after comprehensively reviewing the rationality of holding such shares in the lights of business management strategies and economics of such shareholdings while it has been reducing cross-shareholdings when holding such shares has become irrational. The Board of Directors periodically reviews the status and the policies for holding individual cross-shareholdings by taking such factors into consideration as the purpose of holding, potential risk and expected return, and cost of capital required for holding such individual shares. 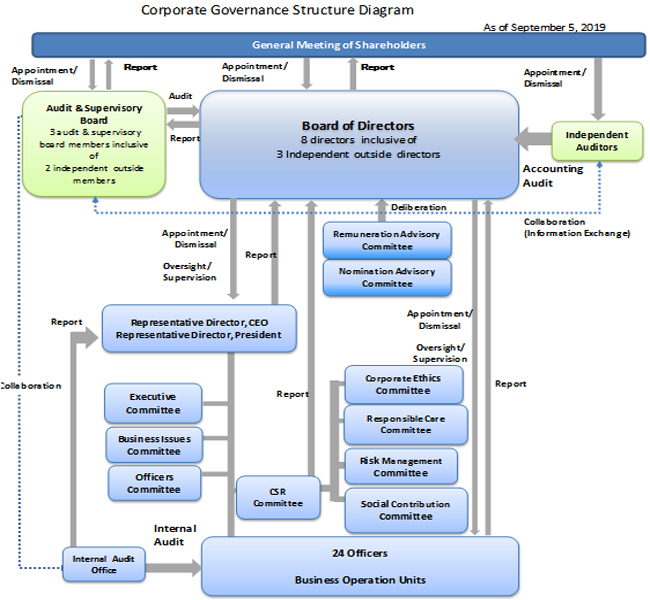 When exercising voting rights of cross-shareholdings, the Company comprehensively determines to vote for or against their proposals after reviewing whether or not their corporate governance system and proposals will contribute to the improvement of their corporate value over the medium and long-term. (1)	While prioritizing growth investment in its Elastomers, Plastics, Digital Solutions, and Life Sciences businesses to continuously create corporate value, JSR has been aiming at providing appropriate returns to shareholders, including combination of dividends and treasury stock acquisitions, by taking into account its business performance and medium and long-term capital requirements. (2)	JSR has been managing its businesses bearing the cost of capital in mind by using the cost of capital as reference for decisions for investment and evaluation of the businesses and by introducing ROI target as a reference to determine mid-term performance-linked bonuses to the directors other than outside directors and officers of the Company. The Company has been and will be continuously endeavoring to improve capital efficiency indices, such as ROE and ROIC. (1)	JSR promoted constructive dialogue with shareholders in the following manner. 1)	JSR appoints an officer in charge of IR. The president or the officer in charge of IR explains business performance, financial positions, and the details and progress of the mid-term business plan at the quarterly analyst meeting and mid-term business plan explanatory annual meeting for institutional investors. 2)	Every year, the president or the officer in charge of IR holds interviews with institutional investors in Japan and overseas to explain the above matters. 3)	Opinions and questions that JSR receives from investors through the above-mentioned dialogues are periodically fed back to management. (2)	In dialogues with shareholders, JSR has strived to appropriately treat insider information. (1)	JSR established its information disclosure policy and prepared organizations and systems for information disclosure. The Company has strived to ensure prompt, accurate, active and fair disclosure of information by establishing a company-wide cooperative framework to improve the quality of information disclosure. (2)	With the aim of actively providing company information to shareholders and investors, JSR posts the information mentioned below on its website: corporation information including business performance, financial position, and details of main businesses, CSR information including efforts to conserve the environment and responsible care (RC), and research and development (R&D) activities. The Board of directors consists of seven (7) directors three (3) of whom are independent outside directors with independence and extensive experience of business and management) and holds meetings once monthly, in principle. The Board discusses and makes decisions on important business matters, including the direction of the Company’s business strategy, and also supervises directors’ and officers’ execution of their business duties. The Board of Directors is chaired by the chairman in principle. However, in the absence of the chairman, a representative director other than the president is currently serving as the chairman for the purpose of securing corporate governance by distinguishing the rolls of president, the chief executive officer of the Company, from those of chairman of the Board of Directors responsible for monitoring and overseeing the execution of the Company’s operations. In addition, all three (3) audit & supervisory board members including two (2) outside audit & supervisory board members regularly attend the Board of Directors meetings to state their opinions. JSR has established the Remuneration Advisory Committee and Nomination Advisory Committee as an advisory organization to Board of Directors. For details of the committees, please refer to II. 1. [Directors] [Voluntary Establishment of Committee] Supplementary Explanation of this Corporate Governance Report. The Executive Committee holds extensive discussions on items relating to fundamental management initiatives, management policies, and management plans, along with important matters concerning the execution of business activities at each department. The committee thus gives direction in relation to these issues or receives reporting. As required, certain items submitted to this committee are passed on to the Board of Directors for further discussion. This committee is made up of the president, officers with directorship status, and officers appointed by the president, and responds to important business execution with the aim of expediting decision making and improving the efficiency of such operations. As a rule, this committee meets once a week, and is chaired by the president. The standing audit & supervisory board member also attends these committee meetings. The Business Issues Committee engages in broad-ranging debate about items related to fundamental management strategies and policies, basic policies behind specific projects, and changes to business strategies. It also shares information to ensure a common understanding of such matters and discusses the company’s direction. Its findings are reflected in deliberations of the Board of Directors and the Executive Committee. The Business Issues Committee, which meets twice a month, consists of the president, executive managing officers and managing officers, and is chaired by the president. This committee consists of the president and all officers (except for those of overseas officers who attend the committee meeting at least annually) and aims to ensure members’ thorough understanding of business conditions and important business matters. As a rule, this committee, which meets once a month, is chaired by the president and the standing audit & supervisory board member is also present. The Audit & Supervisory Board, consisting of three (3) audit & supervisory board members and holding meetings once monthly in principle as stipulated in the Regulations of the Audit & Supervisory Board, receives reports on important matters, holds discussions, and makes decisions. The two (2) outside audit & supervisory board members are independent ones, a lawyer and a certified public accountant qualified as a certified public tax accountant as well, and conduct audits from a standpoint independent from the Company and by using their professional expertise. In accordance with standards for audits by audit & supervisory board members, the audit & supervisory board members attend meetings of the Board of Directors, and other important meetings including Executive Committee meetings to monitor how important decisions are reached and business activities are executed. The audit & supervisory board members also receive reports from the independent auditors, directors, and employees. Through these activities, audit & supervisory board members holds deliberations in order to form auditing opinions. The details of audit by audit & supervisory board members are stated as in the above 5. Audit & Supervisory Board and Audit & Supervisory Board Members. JSR has established the Corporate Audit Department to improve the effectiveness of the JSR Group’s internal control system. In accordance with the audit plan, the Corporate Audit Department regularly conducts internal audits such as compliance audits and business operation audits at its divisions and departments as well as its Group companies both in Japan and overseas and reports the audit results to the president, related departments, and audit & supervisory board members. JSR’s independent auditor is KPMG AZSA LLC. The audit & supervisory board members work closely with the independent auditors. The audit & supervisory board members interview the independent auditors about the audit plan and receive reports on the audit results. Furthermore, the audit & supervisory board members and independent auditors exchange information and opinions as necessary in the course of each fiscal year. Through the JSR Group’s Corporate Social Responsibility (CSR) policy, the Company is committed to behave faithfully as a good corporate citizen and meet the expectations of our stakeholders. It has established the CSR Committee to promote CSR. Under the CSR Committee, there are the following four committees: the Corporate Ethics Committee, the Responsible Care (RC) Promotion Committee, the Risk Management Committee, and the Social Contribution Committee. The CSR Committee integrates and guides the activities of the above four committees and meets four times each year along with special meetings as necessary to further strengthen the management of the Company's CSR and proceed CSR activities.